Maiduguri, 15 December 2017 - For the first time since insurgency stymied healthcare services in the North-east, the affected population now have access to mental health services at primary health care (PHC) facilities in Borno state. To date, more than 2000 clients have been referred to the Federal Neuro-Psychiatric Hospital in Maiduguri, the state capital for further care, while 19 were admitted for in-patient management. The recorded progress is the result of recent collaboration between World Health Organization (WHO) and the Federal Neuro-Psychiatric Hospital in Maiduguri, with the ultimate goal of making mental health services available at PHC facilities across the region. 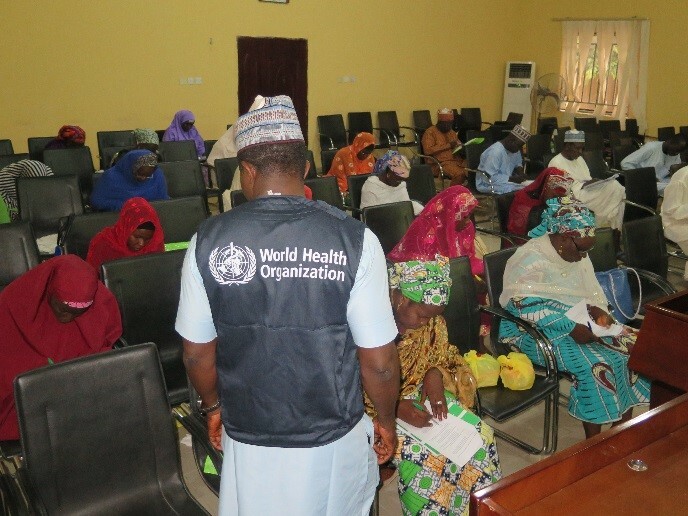 Through its Mental Health Gap Action Programme (mhGAP), WHO has identified and trained 64 general healthcare workers to provide first line mental health care in 36 PHC facilities of Borno state, under the supervision of mental health professionals. Plans are underway to extend the services to Yobe and Adamawa states in view of the vulnerability of the populations affected by the ongoing crisis. “There has been a huge gap in mental health services in the North-east Nigeria even before the crisis as the Federal Neuro-Psychiatric hospital, Maiduguri is the only specialized mental health hospital in the region for a population of over 25 million people,” said Dr Ibrahim Abdul Wakawa, Chief Medical Director, Federal Neuro-Psychiatric hospital, Maiduguri, Borno state. The lifetime prevalence of mental illness among Nigerians is estimated at 12.1%, implying that more than two million people of the northeastern Nigeria might suffer one or another form of mental disorder in their life time. Conversely, in emergency settings as pervades in the North-east, the rate of common mental disorders can even double and the prevalence of mental illness varies from 10% to 20%, due largely to gender based violence, abductions and gross atrocities. Presently, the priority conditions addressed by mhGAP are depression, suicide, epilepsy, dementia, disorders due to the use of alcohol or illicit drugs and mental disorders in children. WHO will continue to facilitate the referral of patients requiring treatment at the psychiatry hospital by covering the transport cost and treatment expenses.